Federico Ristorante Italiano, the spiritual successor to Crystal City’s Cafe Italia, is now open for business. 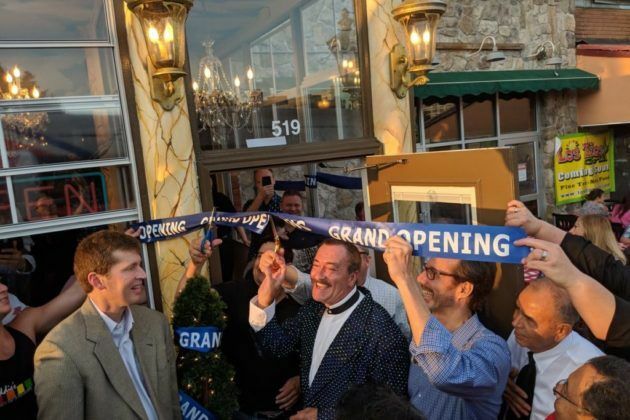 Co-owner Freddie Lutz, who also runs the eponymous Freddie’s Beach Bar, told ARLnow that the revived restaurant held its grand opening Sunday (Sept. 30). Lutz worked for decades as a waiter and maitre d’ at Cafe Italia, located at 519 23rd Street S., and worked with a pair of other former employees to bring the eatery back to life after it closed in April. He’d originally planned to dub it “Freddie’s Italian Cafe,” but decided to change the name a bit in deference to its former owners. Lutz added that the restaurant held a soft opening last Monday, before officially cutting the ribbon on the place Sunday night. Lutz, a longtime South Arlington resident, held an “ice cream social” at his home nearby, then led attendees over to Federico for the big celebration. “We had a line up the street, it was packed and very festive,” Lutz said. Lutz said attendees included state lawmakers like state Sens. Adam Ebbin (D-30th District) and Barbara Favola (D-31st District) and Del. Mark Levine (D-45th District), as well as former County Board member Jay Fisette. Lutz is hoping the new place can capture the spirit of the original restaurant, which was a fixture of the neighborhood since it opened in 1976. Though the eatery fell on some hard times in later years, Lutz expects the restaurant to be packed full of diners for the foreseeable future. “We’ve got our sea legs and now we’re bracing ourselves for the busy times,” Lutz said. ARLnow.com is a WTOP news partner. Subscribe to ARLnow.com’s newsletter today.